For fun and interest I’ll share part of an unusual enquiry with you. Today for a beautiful picture, a very original composition, I received “Do you have any more prints of the painting” : “Rhoda Mary” and “Katie Cluett” A Dispute Settled?” & “Particularly, the large size”? The original was commissioned by a descendant of the builders, passed to his son and shows every sign of eventually passing to the eldest grandson. 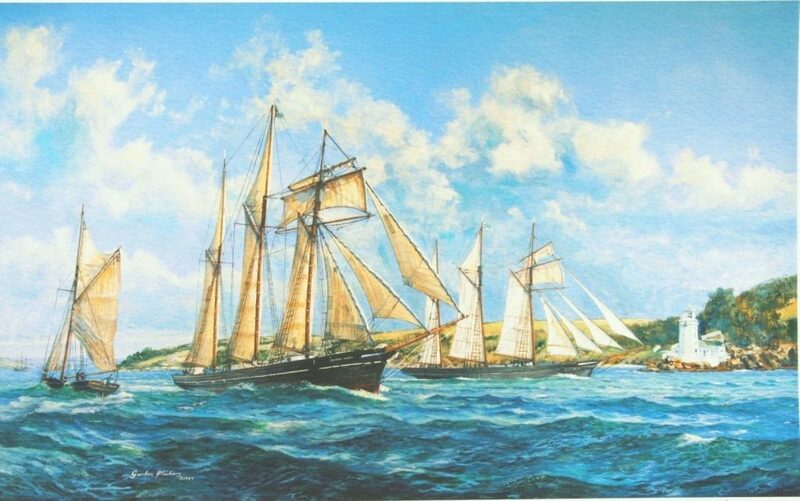 Falmouth Maritime Museum wanted it.Much as I love #Falmouth [I lived there for 5 years], no chance; they will have to commission another version ! I have here at present 1 standard size unframed and one large framed. The large farmed is a bit special. It is print No 1.I’ve kept it for exhibitions.These days I very rarely exhibit. The last time this print was shown was by invitation at the European Parliament in May 2011 so if you’d like this one, it’s yours at no extra cost, price as per my web site ‘Marine Art Prints’ page [https://www.frickers.co.uk/art/marine-print-gallery/] You may like to collect or for a very reasonable fee we can have our specialist deliver to most UK addresses. For overseas we’d have to get a quote for a framed delivery. By way of minimising stock, we can call off small batches of new prints so if you’s like a large unframed this can be arranged although it will take a few weeks. Unframed, available at the web site prices include packing, post, insurance and tracking. This entry was posted on Wednesday, February 13th, 2019 at 10:25 pm	and is filed under Uncategorized. You can follow any responses to this entry through the RSS 2.0 feed. Both comments and pings are currently closed.